We do not curently have theatre tickets available for Let It Be. This could be because we have simply sold out or it could be that this show is no longer running. The information on this page remains purely for historical and informational purposes. 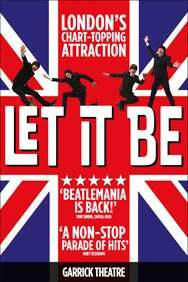 Let It Be returns to London! Let It Be is jam-packed with over forty of The Beatles’ greatest hits. Relive The Beatles meteoric rise from their humble beginnings in Liverpool’s Cavern Club, through the heights of Beatlemania, to their later studio masterpieces, with live performances of early tracks including Twist and Shout, She Loves You and Drive My Car, as well as global mega-hits Yesterday, Hey Jude, Come Together and, of course, Let It Be. Travel back to the magical sixties when all you needed was love, and a little help from your friends! It was 2 hours of Beatles loveliness... Nothing will ever compare to the real thing, but Let It Be is the next best thing to seeing the boys live!